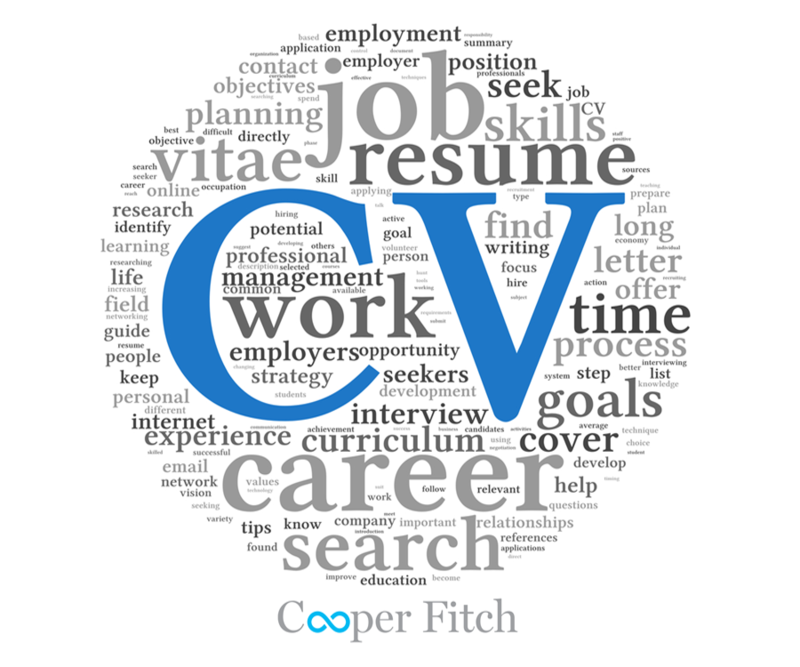 I have personally reviewed thousands of CVs, at Cooper Fitch we sometimes get 20,000 resumes a week. Some of these resumes are excellent, some okay and majority of them are disasters. The concerning thing is, the same mistakes are made time after time by candidates, such mistakes that would eliminate them from being considered for a job. I can guarantee that more than 60% of you have at least one of these mistakes on your CV. In today's fierce and highly competitive job market a small mistake is all it takes for the hiring manager to reject an interesting candidate. In the interest of helping more candidates to make it past the first screening stage here are four of the biggest mistakes I have come across on CVs. This is a common mistake of many CVs, if you are not applying for a job as an artist or a designer, your main priority should be to make your CV clean and easy to read. I recommend at least 10-12 for size, Arial, Times New Roman or Calibri for font throughout the CV. Consistent spacing between lines, normal margins with columns aligned. I would recommend saving it as PDF as the text can get misplaced depending on the version or platform the document is opened on and it is good to go. The main objective is to make sure the CV is appealing to the eye, because it gives you a better chance as the hiring manager will be more likely to read a well-formatted CV. The one mistake that a very high percentage of CVs have, it seems obvious but it happens time after time are typos. People who make changes to their CV very carefully can be specifically vulnerable to this mistake because they tend to go back and make that one last change. This would either a word or a subject do not match or it is left in the wrong place, which then results in the rest of the text to be out of alignment. Checking for typing errors is extremely important as these mistakes can be interpreted as a lack of attention to detail or carelessness for quality. My recommendation is to read your CV before saving it or having someone to proofread the entire CV for you as they are likely to see something you might have missed. is a mistake or a question that does not have a right or wrong answer. A complete CV should be precise and demonstrate the ability to convey the most important information about you. Having a 6-10 page CV is just not going to get the attention and engagement you want from the hiring manager. Let’s be clear: the sole purpose of a CV is to get you an interview, that is it. CV is a tool that gets you the first stage of the interview and then your CV does not matter much. So make sure you precisely reveal the most important and relevant information about yourself. Two, maybe three pages should really be enough. Having a professional picture on a CV is something myself and many professionals would recommend especially in the Middle Eastern market, as it allows you to connect with the hiring manager. However, some of the pictures on CV’s that we receive are beyond belief! The photograph should be professional passport size photo with a formal piece of clothing, not a selfie with your best friends or next to your favourite sports car. A picture speaks a thousand words, so make sure that your profile picture represents a professional candidate. These are some of the biggest reasons why your CV could be rejected. Do not make these mistakes and hand yourself the chance of an interview to prove your real capabilities. The good news is that because most resumes still have these mistakes, by avoiding them makes you stand out. If you would like an insight into the most difficult interview questions asked on a job interview and a great way to answer them, as well as industry-specific blogs, live jobs that are advertised kindly browse through my profile for further information. If you would like to have a confidential discussion on how we may be of assistance in finding your next career move you could send me an email.